So Sunday is Father’s Day, and you’ve found yourself in Miami Beach and wondering what to do. And sure, taking him out for a steak is a pretty sure-fire winner, but what if your dad prefers a 38-item brunch buffet? Or Journey cover bands? Or pedicures? Yeah, it’s 2014. Guys get pedicures. Get over it. Whatever kind of dad you’ve got, Miami Beach has somewhere to take him he’s gonna love. So to help you narrow it down, here’s 10 spots to take your dad, no matter who he is. Wanna give your dad a heart attack? Tell him you’re gay. 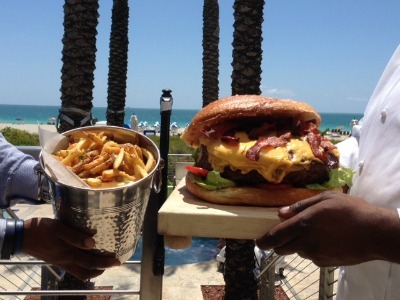 If that’s a little too dramatic for you, you can take him to the Marriott Stanton South Beach for an in-ocean paddleboard lesson, then bring him upstairs for this 40-ounce burger that is bigger than some of the children in their Oceanside pool, served with this massive bucket of fries. Health insurance not included. The James Royal Palm lets Dad enjoy all the fun parts of a Barbecue – like eating all-you-can-eat steaks, brats, Kobe burgers, chicken and shrimp kabobs, and smokehouse chilli, and smoking hand-rolled cigars from their special menu – and taking out all the work by doing it all for him at a downright-cheap $39. Oh, did we mention there’s a Bloody Mary Bar? There’s a Bloody Mary bar. Sure, the cost of gas for getting to Aventura might questionably offset it, but if you hit up The Counter Burger, order yourself one of their awesome custom burgers, and tell them your dad is a BFD (no, seriously, you have to tell the cashier “My Dad is a BFD” or it won’t work) he gets his burger for free. Whether or not you drop the actual F-bomb is up to you. Lapis, the spa at the Fontainebleau is offering a pretty cool package where Dad can get a Weekend Warrior’s Rehab Massage and lunch at Hakkasan for $189. Or, if he’s more into pedicures than Peking duck, he can get a Load off My Back Massage plus a Lapis Mineral Soak and Gent’s Pedicure for $157.50. Because having a tapeworm is really the only way to get your $110 worth at The Setai. They’ll have no less than 38 items at six different stations with everything from caramelized leg of lamb, to truffle roasted chicken, to Alaskan King Crab legs, truffle risotto, Indian butter chicken, and a chocolate dome for dessert. So bring your tapeworm. Because what’s breakfast without 3 shots of really expensive whiskey, Yardbird will be serving something called Pappy’s Pancakes– banana pecan pancakes piled high with candied bacon, warm bourbon maple syrup and three fingers of Pappy Van Winkle’s Family Reserve 20 year. Red, the Steakhouse will have this massive 29oz dry aged Certified Angus Beef Prime tomahawk. It’s RED’s only dry aged steak (also known as the Cowboy Steak) and is for fathers who are serious steak eaters. It’ll be $99 instead of the usual $129. Khong River House will be previewing their upcoming brunch menu with Asian-brunch fusion like Mekong chicken and waffles– hot chicken wings, Mekong rum syrup and whipped butter; Coconut and sesame pancakes– mint, toasted pecans, powdered sugar and coconut rum glaze; and a Thai short rib omelette– braised short rib, red peppers and scallions served with Boran Salad plus Thai basil poundcake, candied kumquats and basil blossoms. Save Dad the effort of dragging out that box that weighs as much as an atomic bomb and waiting all day for his food by taking him to Tongue and Cheek, where they’re serving up their first ever pig from the Caja China and giving dads a free bourbon cocktail or craft beer. Jungle Island is letting all dads in free to their 2nd Annual Father’s Day Bash from 11 a.m.-5 p.m. where he’ll get free Harpoon Brewery beer tastings that he can take to the arcade-game equipped man cave, or to performances by Mad World Orchestra and Journey tribute band, Odyssey. Plus there’ll be a classic car show and food from BC Tacos, Che Grill, Da Burger Shack and Monster Burgers. If you get tired waiting for him, Green Mountain Coffee will also be passing out free samples.